http://bodegasfabre.com Our itinerary included visitng the two primary wine producing provinces in the country; Mendoza, responsible for 80% of all wines produced and second in production San Juan, a little further north, with differing soils and climate producing wines of its unique personality. First stop was in Vistalba located in the “departement” of Lujan du Cuyo, in Mendoza, at a boutique winery called Fabre Montmayou. Geographically, think of Argentina as a big set with multiple subsets. Argentina, divides into fourteen provinces, with Mendoza being the king-pin of wine production, within Mendoza there are “departements” which include Lujan de Cuyo and the Uco Valley, which we later visit, with each expressing differing characteristics, and within the departement of Lujan de Cuyo is Vistalba, the home of Fabre Montmayou. We speak of roots, and here at Fabre Montmayou on 15 hectares, they run deep, with the Malbec vines dating back to 1908 brought over by the first immigrants to come to Argentina. The roots, or ancestry of founder Herve Joyaux Fabre come from Bordeaux, with generations involved with the vine. In 1992 on a visit, Herve was seduced by the potential of the magnificent malbec grape in Mendoza and there was no turning back! Fabre Montmayou was born. 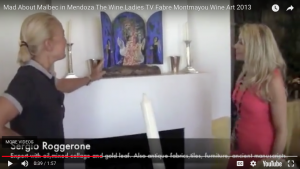 Here Diane and Herve proudly show us a very special piece of art graceing their family room, one done by friend and famous artist Sergio Roggerone celebrating the harvest and Festiva Vendimia.